East Crow Saddlery, based in Northwestern CT, helps riders of all English disciplines obtain the optimum performance and safety of their saddle and other tack. 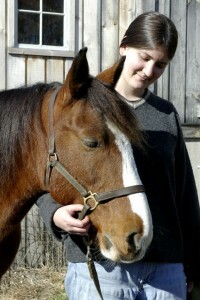 Patty Barnett, owner of East Crow Saddlery, is a lifelong horseperson with extensive training in her field. She apprenticed as a saddle fitter with Gary Severson (known as the Saddle Doctor), is a graduate of Margie Amster Herr’s Equi-Myo Therapy program, and takes approximately 30 hours of relevant continuing education courses each year to keep her knowledge up to date. In addition, she completed the U.S.-based introduction to saddle fitting, Level 1 bridle making and Level 3 of saddle making courses of the British Society of Master Saddlers training program. To learn about saddle fitting and the products and services we offer, please click on one of the menu selections above.